Vinyl siding the most commonly used home cladding in the United States. Low maintenance, affordable and durable, it’s no wonder this material of siding is so popular. Fortunately, refreshing your vinyl siding and making it look like new isn’t only possible, but also very easy! When cleaning your siding, it’s best to take a cautious approach. Since it’s so resilient, taking a pressure cleaner at full force to your vinyl siding may sound tempting, but it can cause the pieces to misalign and slide out of place, ultimately damaging it. Follow the tips below and you’ll be on your way to a sparkling exterior that’ll stand the test of time. To start cleaning your vinyl siding, take a soft cloth or brush and wipe the siding down. 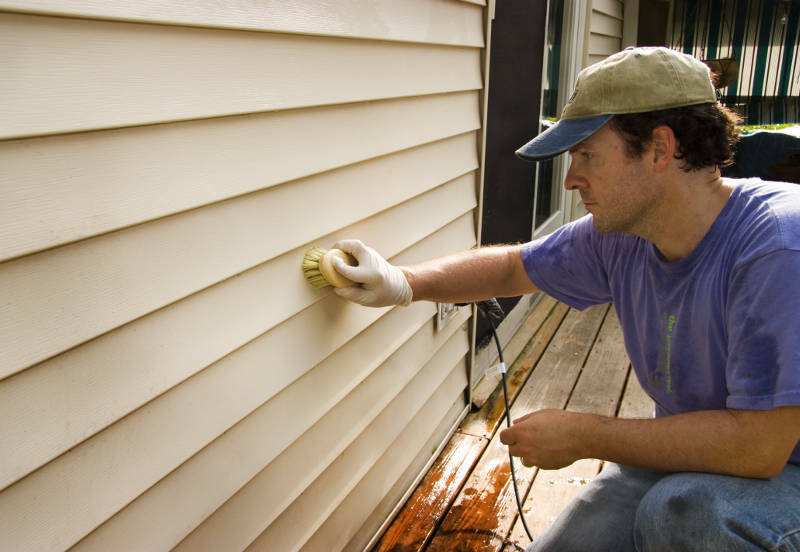 Make sure to avoid using rough-bristle brushes or anything that is abrasive which can damage the siding. After you wipe away the dirt, spray or hose down the siding. If you own a pressure washer and would like to use it when spraying down the siding, make sure it’s set to a medium strength with the water distributed at a wide angle (many manufacturers caution against using a pressure washer altogether; we advise you make sure to check your warranty). As you scrub or wipe down the siding, it’s important to start from the top and work your way down to the bottom; this will prevent streaking. When you’re done removing the dirt, rinse the siding off, beginning at the top and working your way down to the bottom. As you spray down the siding, be careful to aim the spray straight, pointing directly at the siding so that water doesn’t find its way behind it and end up at your foundation. Sometimes your vinyl siding needs a little extra cleaning and there are many solutions that can help you with that. If you do decide to use a pressure washer, most will let you add soap or detergent that’ll mix directly with the water as it sprays out. If you prefer to play it safe, you can create your own mixture in a bucket or a one-gallon sprayer pump, and spray the siding down little by little. Allow the cleaning solution to sit for several minutes before hosing it down; this method is ideal for helping break down excessive grime. Using a broom or soft-bristle brush with a long handle will allow you to reach corners and higher areas of the home. Here are two powerful cleaning methods you can use to refresh your siding. Add 1/3 cup of powdered laundry detergent, 2/3 cup powdered oxy clean and 1 quart liquid laundry detergent to a gallon of water. Using bleach and detergent goes a long way towards removing mold and mildew. After applying the cleaning solution over your vinyl siding, give it some time to sit and work. After a minimum of five minutes, you can rinse it off with a garden hose; the longer you let the solution sit the better it’ll work. Taking the extra time to wipe down the siding with a household cleaner gives you much better results than using a pressure washer. Although it takes a bit longer, going through each area slowly and thoroughly gives you the opportunity to focus on details. Details that you’ll likely miss if you do a quick once-over with a pressure washer since the force of the spray tends to move dirt around. When you’re using this bleach solution, make sure you follow the safety instructions located on all the products. You never want to use bleach around animals or children, and it’s always best to wear gloves and a long-sleeve shirt with pants. Bleach can stain your clothes, so wear something you won’t mind getting ruined. If you have landscaping around the siding you’re spraying down, take extra caution as the bleach can harm the plants and grass; covering the area or taking precaution usually prevents problems. To start, combine 1/3 white vinegar and 2/3 water in a bucket. Add this combination to baking soda in a small bowl or plate to create a paste for hard stains. Using this mixture of white vinegar with water is an ideal cleaner for your vinyl siding and is actually one of the most effective ways to target mold and mildew. When using this method, you can scrub the siding with a large brush, keeping a smaller brush at your disposal for persistent stains. Using a small brush to reach the cracks and crevices will take you longer, but you’re guaranteed to target the most minute details. If you hit a rough area of mold or mildew, create a paste with baking soda and scrub it down. As usual, allow it to sit for five to ten minutes before rinsing it off. If you decide to clean your siding with vinegar, take the same care to cover your landscaping as you would with bleach since vinegar can damage your plants as well. When your vinyl siding is dirty, it takes away from the curb appeal and value of your home. You can’t just sit there and ignore the problem – you need to learn how to clean vinyl siding properly. This article offers two methods of cleaning vinyl siding that work. Your home will look its best and it’ll be easy to maintain. Speaking of vinyl siding, if you need to replace your home’s exterior, Feldco is here to help. We offer high quality, vinyl siding that’s sure to look great and stand the test of time. Get a free quote now and join 350,000 happy homeowner who have used Feldco over the past 40+ years.